Our sweet Ellie turned 7 over the weekend. If you’ve been following along Beauteeful Living, you may recall her Frozen-themed birthday party from last year. Since last year we invited Ellie’s close friends from town, we thought this time around, we’d invite close family and friends from back home (NY). While I wanted to keep the party simple and casual, I still had a vision for the party decor. In my mind, I was thinking flowers and spring colors. 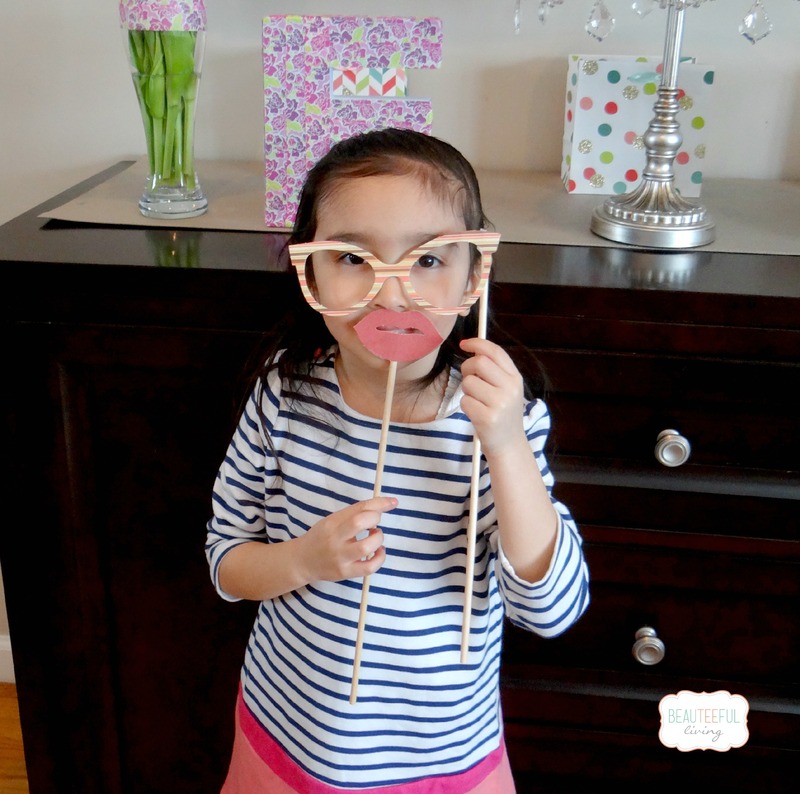 I hope you enjoy taking a peek into Ellie’s Spring Themed 7th Birthday Party! 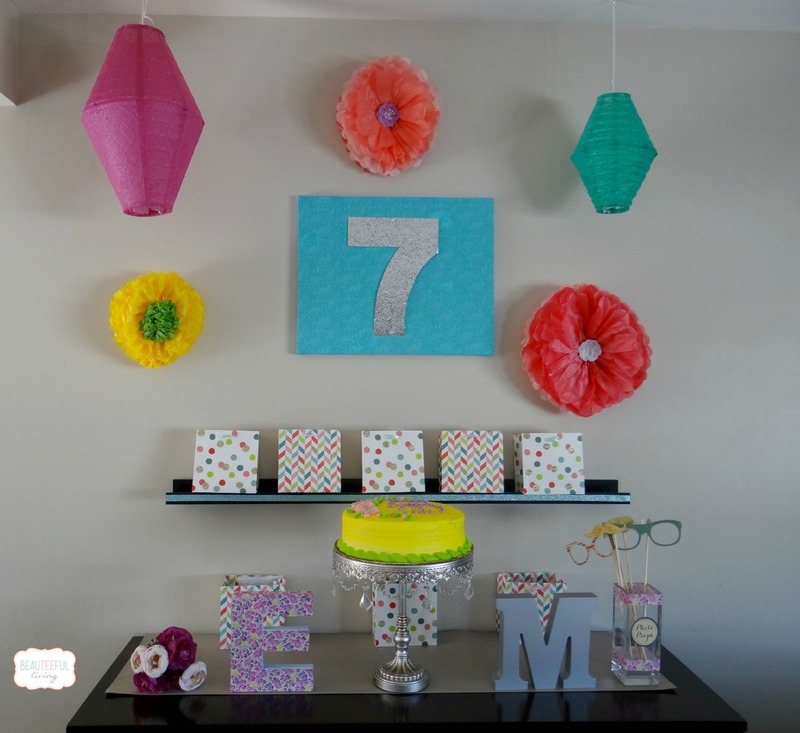 Instead of doing a birthday banner, I decided to display a prominent “7” against a fabric-covered canvas. I added the letter blocks “E” and “M” (her initials) to further personalize the party. 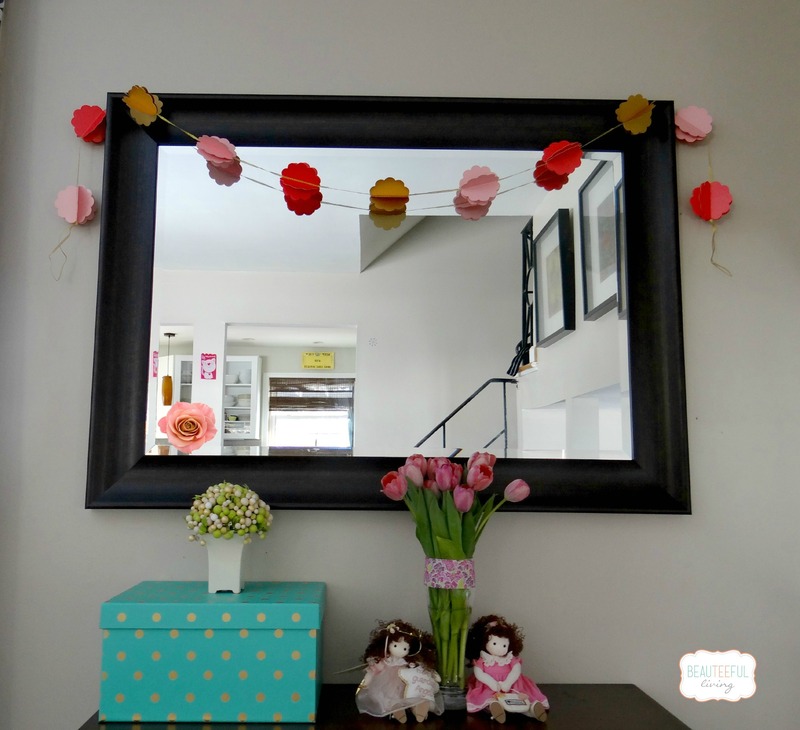 The hanging paper lanterns and paper flowers really added to the bright spring look I was after. For special occasions, I typically hang decorative items on this pendant light. 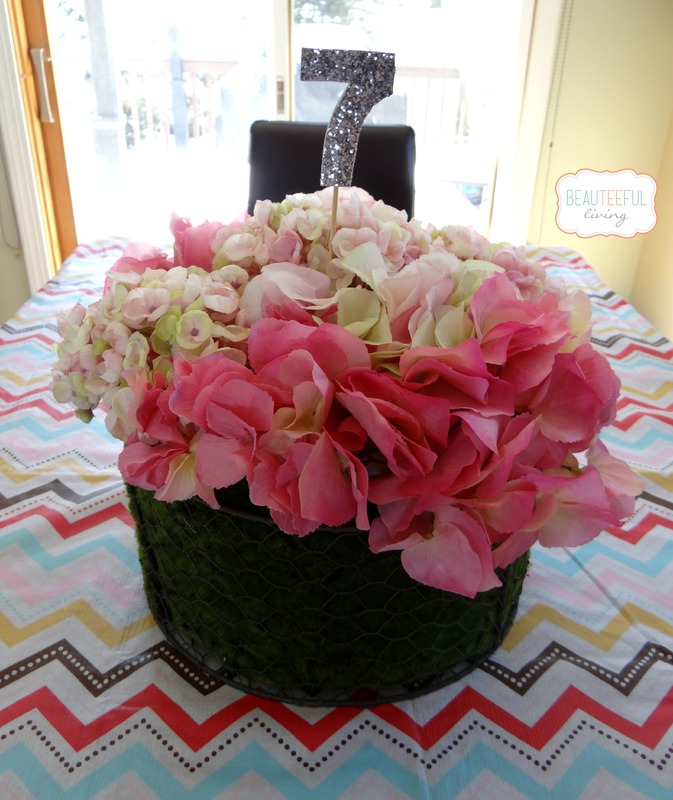 For this party, I added floral trim around the shades to go with the floral party theme. Can you believe this was done with Scotch masking tape? So easy to use and remove. I love having garland hanging for parties. When I saw this garland at Target, I knew the colors would go well with the theme of Ellie’s party. Also, a vase filled with tulips (picked by the birthday girl) was exactly what this table display needed. I just love tulips! Of course, Ellie’s little sister was all into posing for pictures. These two are stuck to the hip…literally. Love this photo of them together! This smile says it all. Ellie had a wonderful day spent with some amazing people in her life! 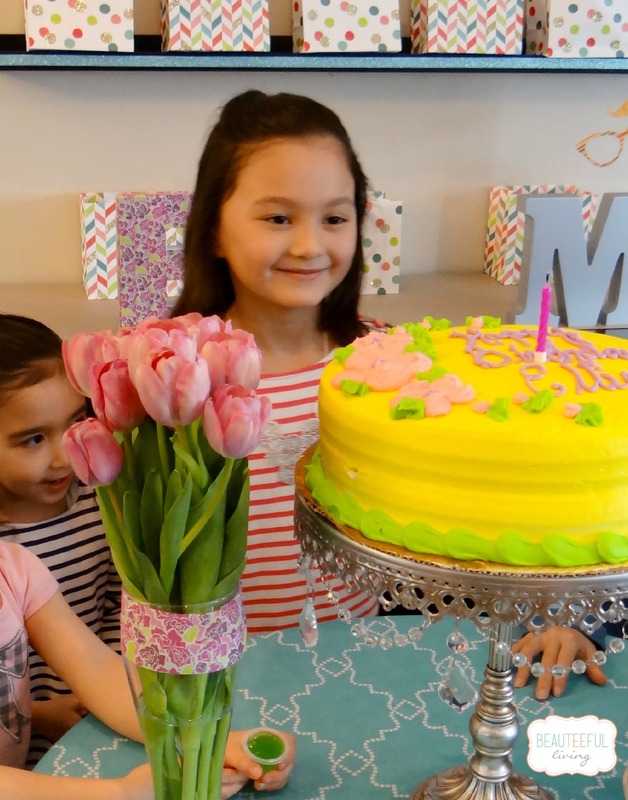 We had a great time hosting Ellie’s 7th birthday and are incredibly grateful to have such wonderful and kind-hearted people in our lives join our celebration. While most of them are family, a good number of them are also people who’ve become family in their own right. For those who weren’t able to make it, please know that you were there in spirit! Beautiful!!!! I love all of the pictures. The cake is gorgeous. Seeing this beautiful party makes me wish I had girls!! Beautiful party. My girls would love a party like this one. Thanks for sharing. I love this!! How creative is this cute party. I’m a nanny and have been in charge of planning parties. I’m definitely going to use some of your ideas. I love the simplicity. Thanks for sharing! I’m amazed at how special and personalized the decorations were! Beautiful party photos! In my family, we consider it a job well done if we remember to hang the dollar store generic happy birthday banner and blow up a couple of balloons. I’m in awe of people like you that can create a truly unique experience for each birthday. Great job! I love it! My daughter is a spring baby as well, and she loves bright beautiful spring colors. This has given me some good ideas to work off of for the next party. Definitely going to keep track of this post! How adorable! I LOVE putting together parties especially when it’s DIY! I am totally digging the scotch masking tape on the pendant lighting. Easy and cheap! So cute!! I love your ideas & it looks so simple yet elegant. Thanks for sharing! It looks like you planned a wonderful party. I really enjoyed reading your decorating tips, and seeing pictures too. I am not crafty. But your tips seem doable for even me. I love the colors and wave of spring. I know we could all use it. I have a bday party to plan this summer and I am definitely using some of your ideas. Thanks for sharing. What a lucky little girl to have such a gorgeous birthday party! I really love the floral trim around the lighting – the little detail added so much to the decor! Oh, and those glasses? love ’em! I loved the way you decorated for the party, it was very pretty. The centerpiece from Home Goods was a good find, it looks amazing! I loved the photo props as well! Great job! I love the colors and refreshing spring look to the party. We try to do themed parties, however, we have 3 boys that only care about the cake and a daughter that would love something like this. Thank you for sharing. Love the Spring colors! My 18 y/o son would kill me if I did a party like this for him. My wheels are turning though, thinking that with a few tweeks, it would be great for a “baby girl” shower. It is beautifully simple! What a great spring party. I love how you really pay attention to details. Theresa, beauteeful ideas for parties. I love your ingenuity. I gained some great tips for my three boys birthday parties in the near future. Also, I have to wish Ms. Ellie a HAPPY BELATED BIRTHDAY. My oldest will be eight this summer. My wife and I will use some of your ideas. Thanks. Blessings to you and your family. You did such a nice job with decorating! Your daughters were so cute on the pictures! 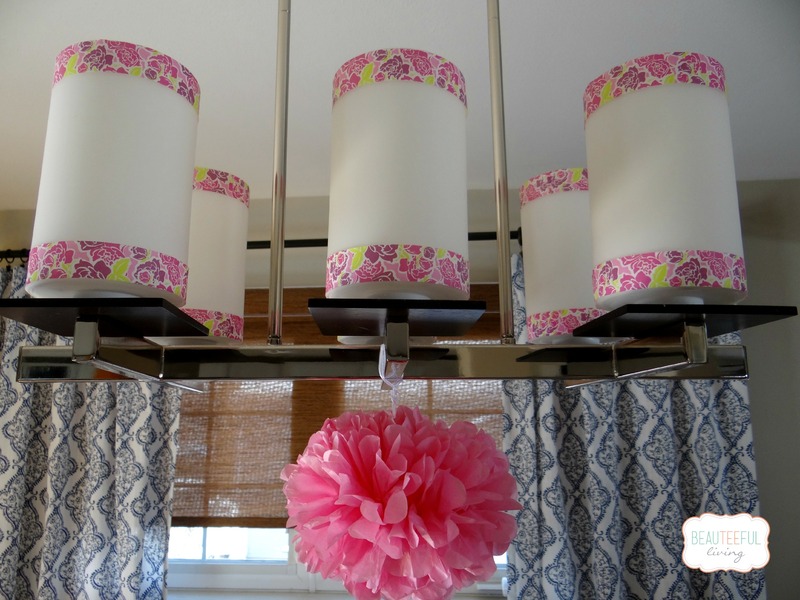 Brilliant idea to use scotch tape to decorate the lamp shades. I love spring colors, and there is no better way to welcome spring in my home that bringing in some tulips! Adorable girls, beautiful party. So cute! And I love the photo props. I always forget about those when planning a party. It could be because I’m usually throwing all together at the last minute. Oops! What a Beautiful party. 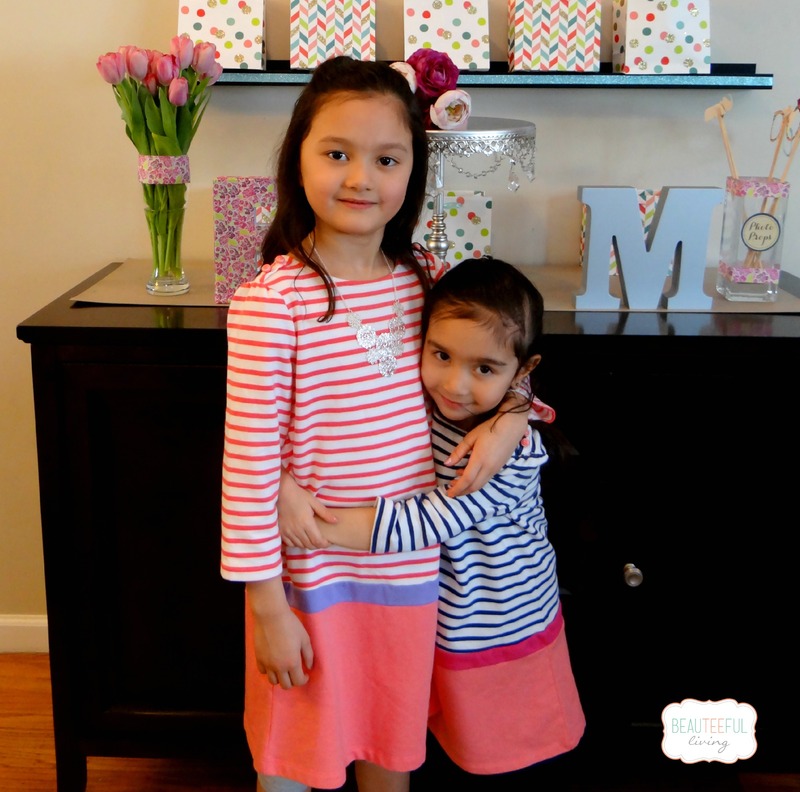 I can see myself using some of your ideas to have a Let’s Celebrate Spring party. Any excuse for a party. Thank you for sharing and Have a Fabulous Day!! 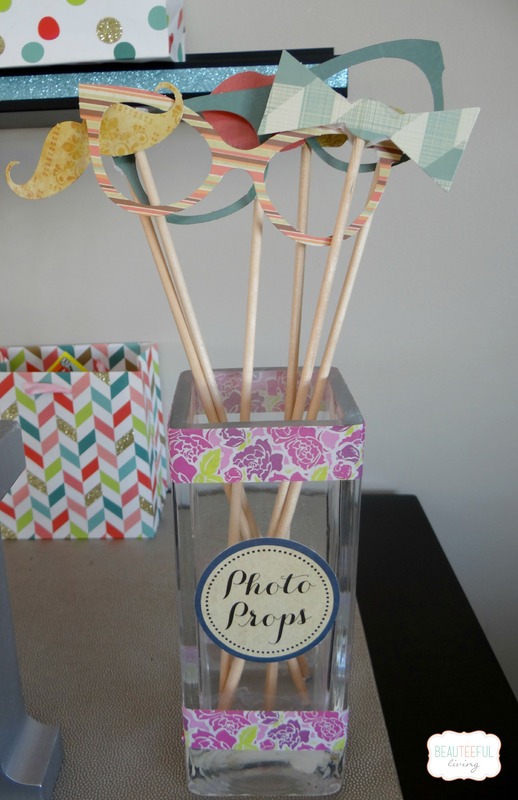 Love the photo props! What a fun way to welcome spring! Oh my gosh your girls are beautiful and this post makes me wish I had a girl so badly! My two boys would kill me if I tried to do a spring party – basically if it isn’t transformers it isn’t okay! You did such a good job at pulling it all together and making it kid friendly without being too kiddy – if that makes sense. I love it so much! I can’t wait to look around and see all of your other awesome stuff! Do you happen to have any boy party ideas? I’m always looking for new ways to throw cute yet boy parties. Love this post so much! Maybe I’ll start a book club or something just so I can decorate girly! Hi Katy! You are so sweet. Thanks so much for your kind words! I have lots of boy party ideas but haven’t been able to execute them since I only have little divas to throw parties for! Lol. I need to throw a boy party for my nephews or friends’ boys one day. I love your idea of starting a book club just so you can use girly decorations. Anything that gives me a reason to decorate is good by me ;). This was such a beautiful party! I bet your daughter loved it! I know I would if it was my birthday! 😉 I also really loved your tip about using the fun prints of masking tape with the decorating to make it cute and easy at the same time! What a great idea! Cute, cute! Good job, Momma!! Love the tape on the light fixture… might steal that one! I love it – the bright colors and all the fun photos. You are very creative. 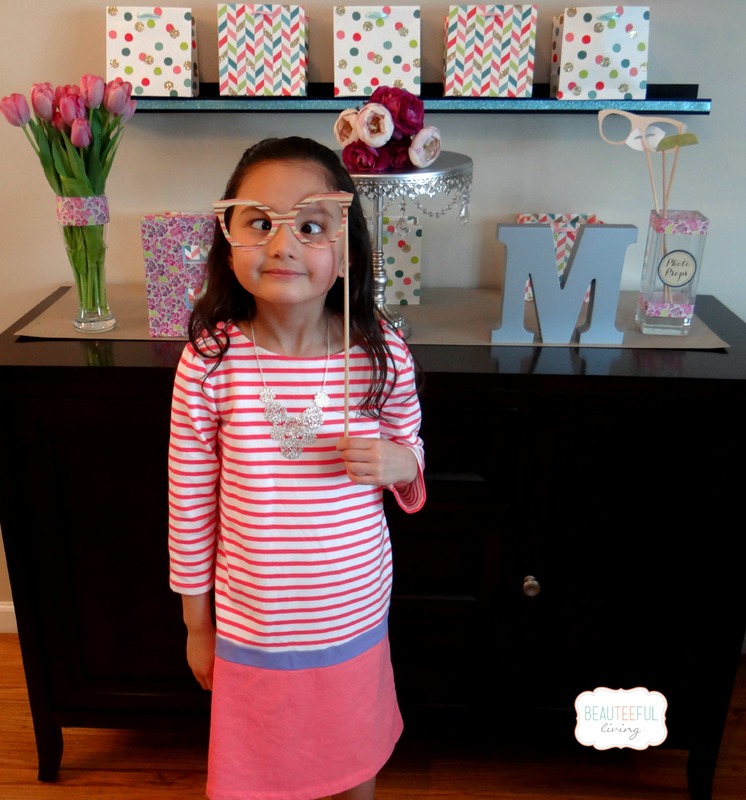 What a delightful spring themed party you have created for your daughter. I especially love the photo props which I am sure resulted in lots of fun poses and photos. 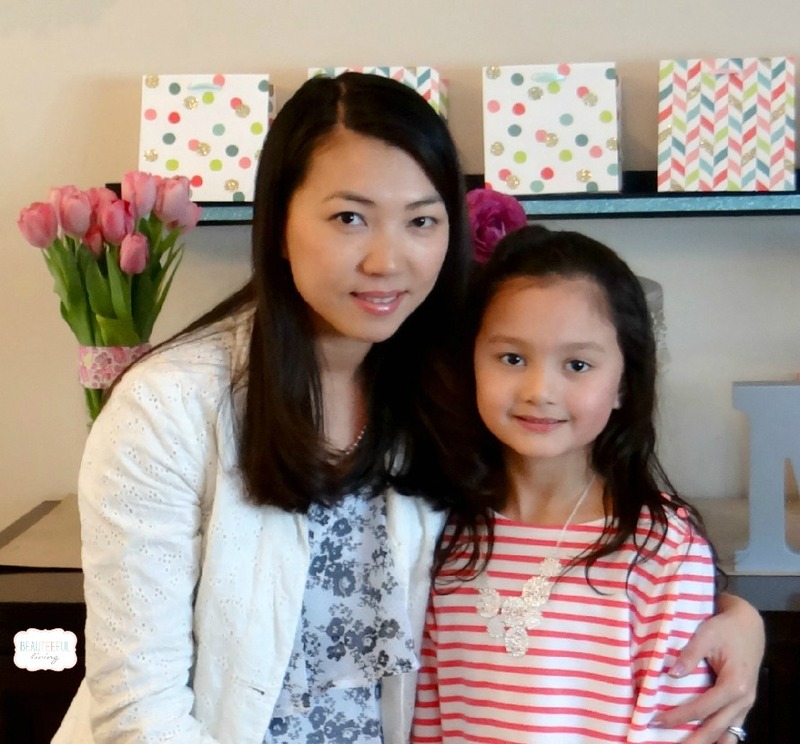 I can see from your daughter’s smile that she enjoyed her special day, thanks to all of our creative work! Kudos! What beautiful decorations! My daughter’s birthday is just a few days after spring begins, and you’ve inspired me. What a lucky little girl! You did an amazing job decorating. I loved the cute pics and the silly faces. I also liked the hydrangea plant, so pretty. I don’t know what girl wouldn’t love a party like that! So pretty and elegant, and the cake looks amazing too! Nice work!! I am jealous of your daughter’s spring birthday!! You did a fantastic job tying in all the great colors. I love what you did with the pendant lighting. I don’t have a daughter, but I’ll be sharing your ideas with my friends who do! How colorful. A Spring theme was good idea. My favorites are the garland and the photo props. This made me smile! What a lovely party it must have been and your daughters are gorgeous! My children are grown and are now becoming moms and dads themselves, but I cannot wait to start planning birthday parties once again. I have four grandchildren and three of them are all born on the same day! One from my son and twins from my daughter and of course, it’s rainy cold November so we’ll see how that works out! It looks like your daughter had a lovely party! Your decorations were very thoughtful. Wow, all of this looks so amazing! One of my cousins is about to throw her daughter a party, and she’s around the same age – maybe I can help her put something like this together 🙂 If I can get it to look even half as good as yours, I’ll be happy! This is such sweet party decorations! I love the small details in it all. Also her silly face is on point! I had no diea that the centerpiece was not real flowers. Love that! 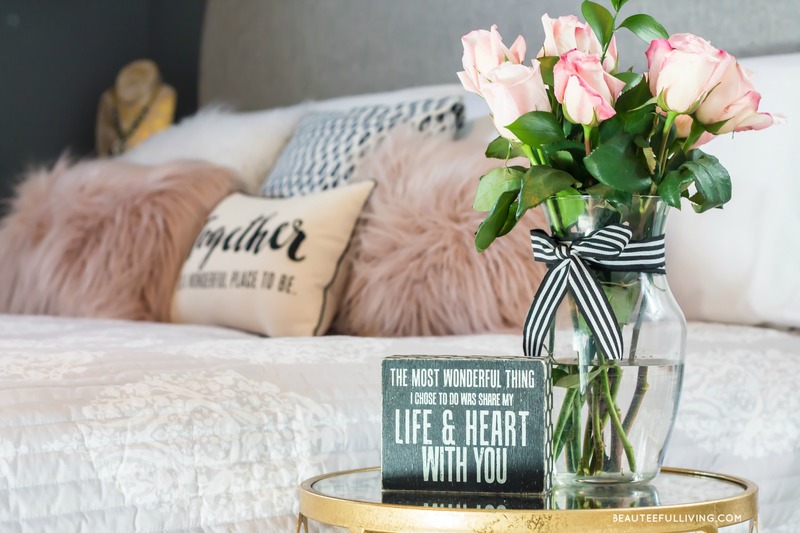 I love to have flowers in my home, but it can be difficult and pricey to do year round here. In the summer I cut my own blooms, but in winter I have to order them. Fake ones NEVER look that nice! Great find! It looks like a fun day for all! The decorations were so pretty! What a nice change from the mass produced party decorations. Great job! Everything was so pretty! And yes, I love the Spring colors. 🙂 What a great idea using the tape to add some detail to the lamp shades – I love that! I’m glad it was a happy birthday!